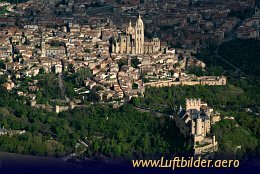 Segovia, one of the three historic metropoles near Madrid is spectacularly located on a narrow promontory above two rivers. The historic city contains the Alcazar palace, an ancient Roman aqueduct and the cathedral. The old city is a UNESCO World Heritage Site since 1985.